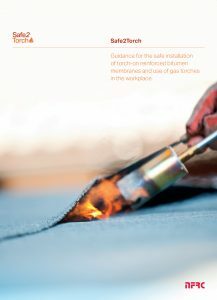 The Safe2Torch campaign is designed to support specification writers to comply with the Construction Design and Management Regulations 2015. The CDM regulations state that, ‘The person who selects products for use in construction is a designer and must take account of health and safety issues arising from their use. If a product is purpose-built, the person who prepares the specification is a designer and so are manufacturers, if they develop a detailed design. The guidance includes an illustrated document which is free to download and includes an updated safe specification checklist. This checklist will form the basis of an electronic surveying app, which the NFRC will be launching. Users will be able to upload photos and notes via a smart phone or tablet, with a webcast setting out the main points of Safe2Torch for those conducting the surveys as well as tips on how to use the surveying app. The Safe2Torch guidance also covers the reduction of fire risks in general, including drying out decks and hot works permits etc.